Nudie Jeans is changing the ownership model for denim jeans and providing best in class stewardship for transparency. The company is at the top of its class for providing information on supply chain, self reporting their social responsibility report card, using organic materials and fair labor. They have other culture changing initiatives that other companies many find too bold, such as recommending not washing your jeans for the first six months of ownership, even with daily wear. Corporate Social Responsibility Manager Sandya Lang tells us more about how this Swedish denim label is bringing unique perspective to sustainable fashion. Maria Erixon, Nudie Jeans Creative Director, has stated that “Nudie Jeans was a dream about not having to compromise.” For you Sandya, how does this change the focus and the day to day culture for those working at Nudie Jeans? Nudie Jeans was founded in 2001, almost fifteen years ago now so we are still a young company. I think this idea still definitely lives on and is an evident element of our every day culture, but when you grow as a company with more people involved and new departments developed, structure and a more formalized set up is inevitable – it can become harder to maintain, but we just have to work harder to do so. Ironically, that’s what makes it a more of a living reality and not a dream. 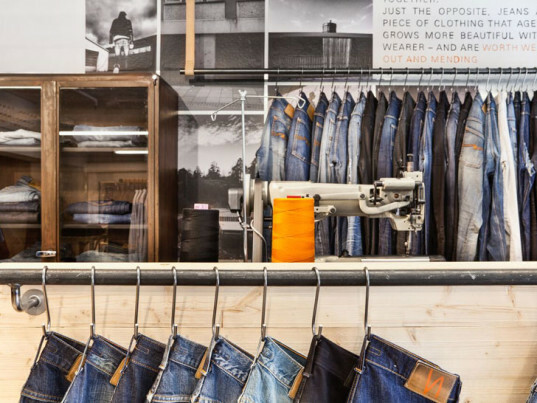 How did Nudie Jeans get started with the idea of having repair shops and DIY kits? The repair service in stores started in 2011, and was focused more so on our local Swedish stores in Göteborg and Stockholm. 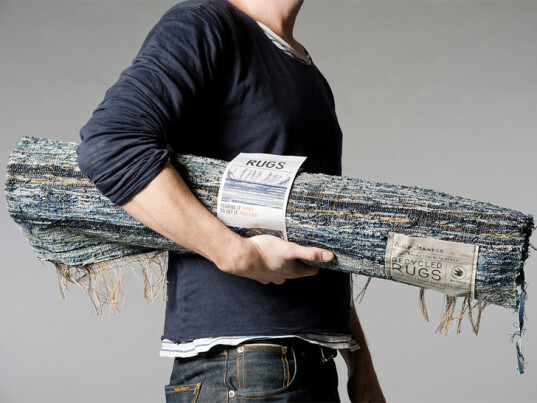 In 2012 it became a lot more official and on a larger scale following the 2011 Swedish“Bra Miljöval”/ “Good Environmental Choice” certification for our in-store second hand denims program – a “by-product meets innovation” from the repair service where old Nudie Jeans can be donated for 20% off a new pair. We collect the old pairs and either bring back to life in store and sell on, or use for recycling projects like limited edition rag rugs. It’s only been 3 years since the repair service was majorly implemented – now all 21 stores worldwide offer the free service and last year alone over 30,000 pairs of jeans were repaired. The Repair Kits were an early idea born out of the same principle of the Repair Shops – to give jeans a longer life – and are for our customers who cannot make it into one of the stores but they can repair at home. Your production guide is really comprehensive and impressive. What is the process like for adding any new partners and auditing existing partners? The production guide which is our basic online supply chain transparency tool shows all active suppliers for the current collection in the shop (for example, now is FALL 2015 showing) organized by style categories – jeans, shirts etc.). Our process of choosing new suppliers is a thorough with many aspects considered, such as ability to make our products, delivery time, CSR related issues, price, communication, and so on. We also visit the supplier in person – sometimes several times – before starting production. Previous audit reports are also considered and we of course make audits ourselves at an early stage to know exactly what we have to work on from the outset. It is obvious that Nudie Jeans truly cares about the garments even after they are purchased. Are you seeing a shift in the culture of denim care? Yes, we can see an increased awareness among consumers that are interested in repairing and reusing, and locally in Sweden are seeing more sewing machines pop up in other denim shops for hems and alterations. There is one place in Gothenburg which specializes in vintage denim and offers handmade repairs on vintage denims. This emergence could very well be an indicator the industry is starting to care more about repairing and recycling and emphasis on looking after garments, because for sure we know customers are definitely more interested in requesting for this type of service. What are you most proud of about Nudie Jeans? I am most proud about working in a company where sustainability is really a core value and we work hard at doing the things we put our word to, and also we hold a front position in many areas of sustainable and ethical production (living wages, organic cotton, repairs and transparency mainly). Nudie Jeans is changing the ownership model for denim jeans and providing best in class stewardship for transparency. The company is at the top of its class for providing information on supply chain, self reporting their social responsibility report card, using organic materials and fair labor. They�have other culture changing initiatives�that other companies many find too bold, such as recommending not washing your jeans for the first six months of ownership, even with daily wear.�Corporate Social Responsibility Manager�Sandya Lang tells us more about how this Swedish denim label is bringing unique perspective to sustainable fashion.